A Hat in Time is developed by Gears for Breakfast. 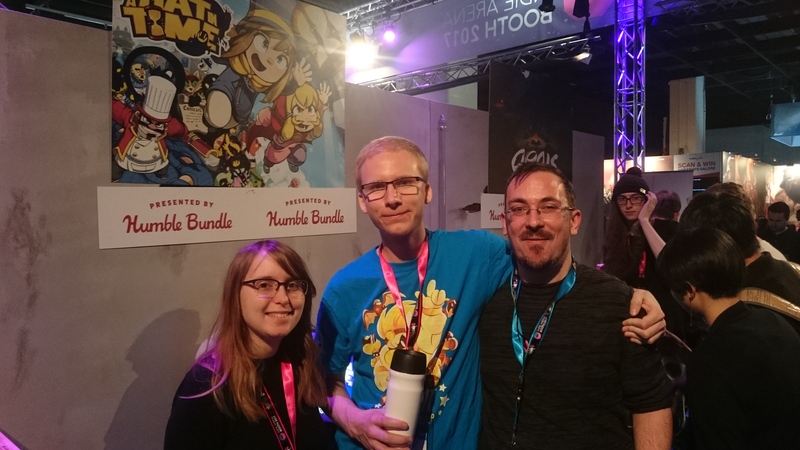 We had the pleasure of talking with the developers of A Hat in Time, Gears for Breakfast, at Gamescom. They told us about the noir inspiration behind this cute game and how they delved into movie cinematography to create the world that Hat Kid travels in. Other influences behind the game were Psychonauts, obviously Mario and the masterpiece by Agatha Christie, Murder on the Orient Express. As we were told, A Hat in Time has a narrative base where the player will piece together the plot through platforming and eventually find out about the bigger story through acts. Each chapter will be a self containing experience with many easter eggs, storybooks and more hidden items for the player to unlock. Of course they have the option to do anything they wish and just go around helping Hat Kid to find the time pieces and get back home. Gears for Breakfast started working on the game four years ago and as we were told, they are about fifteen involved with the game’s development, working remotely online, which is pretty impressive. A Hat in Time was successfully funded through Kickstarter and after the beta version was very well received, the studio also built a speedrunning community which is understandable, since the team focuses on fast controls and gameplay. The developers will also make it accessible to modders, because they want to give back to the players and those who want to create something with their game. A Hat in Time is going to be released on October 5th for Pc, PS4 and Xbox One. You can learn more about A Hat In Time through the game’s website and Steam page.